Here's a fun gift idea! 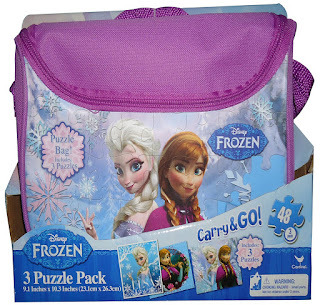 Hurry over and check out this Frozen Carry and Go 3 Fashion Bag Puzzle (48-Piece) for $7.32 before the price jumps. Banana Republic - Extra 50% off Women's Sale & 30% off Men's Sale! Now through July 15th, save an Extra 50% off all Women's Sale + 30% off all Men's Sale at Banana Republic with code BRSAVE. Ends 7/15. Restrictions apply. Restrictions: Offer valid in store and online at Banana Republic through 7/15/15 in the US and Puerto Rico. Click here for complete details. I love this Gemma Wrap Dress for only $39.99 (Retail $98.00). Stella & Dot Blue Paisley Tunic Womens & Girls 40% off! Stella & Dot is having a Flash Sale! Today only (7/9), you can get 40% off Stella & Dot's Blue Paisley Tunic for Women and Girls. The Blue Paisley Capri Tunic is a favorite new cover up of the season! Wear it as a cute tunic over your swim suit or pair it over shorts or skinny jeans as a casual top. Gorgeous embroidery and fun poms paired with exclusive Stella & Dot prints make this a truly unique piece for the season. Today only, Amazon has the ESPN Films 30 for 30: Five-Year Anniversary Collection BD [Blu-ray] for only $69.99 Shipped (Retail $199.95). 20-disc set features 100 films, including the complete 30 for 30 film series, 30 for 30 Soccer Stories, Nine for IX as well as a selection of additional films and 30 for 30 Shorts. Old Navy - $5 Kids & Baby Styles, $5 Uniform Polos + Up to 35% off! Today online only, Old Navy has $5 Kids & Baby Styles, even Uniform Polos. (You will have to go to the kids or baby category to find these deals) Plus, save 35% off until 3PM PT or 25% off from 3PM until 12AM PT with code: TICKTOCK. (Code excludes clearance, everyday steals, hot deals, today-only deals and uniforms) Offers end 7/9/15.